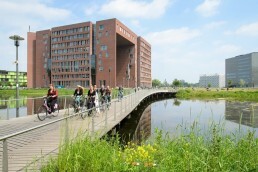 The University of Wageningen has a large campus with many activities to see and take part in. The many students in this location come from all over the world. But how can you show the international students the campus and the student life in a thorough manner? They are usually not able to travel up and down to see the university for themselves. In collaboration with Wageningen University & Research (WUR) we found a solution to create enthusiasm within the international students to come and study at the campus. 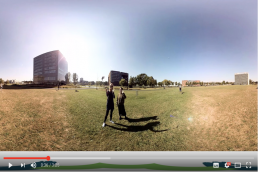 Wageningen University & Research has shared the 360 degree video tour in their social media channels and on their website. In the meantime the video was viewed for over 6000 times on the university YouTube channel and is used in the promotion of the school on a regular basis. Apart from the video we have produced one hundred printed cardboards for the WUR, fully designed in the university corporate identity.